American actress Julie or Julia Adams (1926-2019) passed away last Sunday, 3 February 2019. Adams starred in a number of films in the 1950s. She was best known for the cult film The Creature of the Black Lagoon (1954). Italian postcard by Bromofoto, Milano, no. 1210. Photo: Universal International. Betty May Adams was born in 1926 in Waterloo, Iowa, but she grew up in Arkansas. Her Arkansas-born parents were Esther Gertrude (Beckett) and Ralph Adams, who was a cotton buyer. Betty made her acting debut in a third grade play, Hansel and Gretel. When she grew up, Adams decided to become an actress. 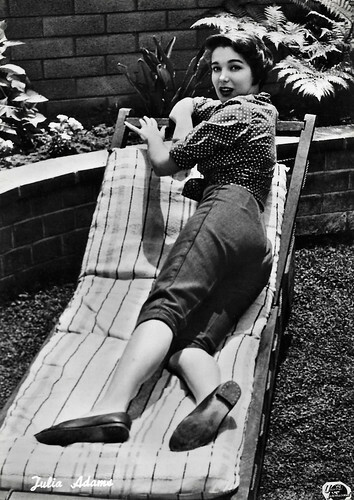 At age 19, she was crowned Miss Little Rock 1946 and she then moved to Los Angeles, California to pursue her acting career. There she worked three days a week as a secretary and spent the remainder of her time taking speech lessons and making the rounds at the various studios' casting departments. Her first film role was playing a starlet, appropriately enough, in the Paramount musical Red, Hot and Blue (John Farrow, 1949) with Betty Hutton, followed by a leading role in the Lippert Western The Dalton Gang (Ford Beebe, 1949). Over a period of five weeks, she appeared in six more quickie Lippert Westerns. Robert L. Lippert was an American film producer and cinema owner who eventually owned a chain of 118 theatres. 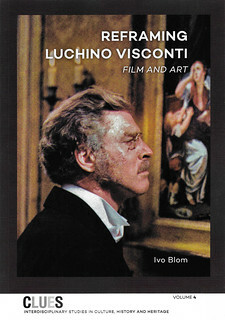 His 'Poverty Row' studio Lippert Pictures produced and released 130 B-Westerns between 1948 and 1955. Adams' first big show biz break was at Universal, when she appeared in a screen test opposite All-American footballer Leon Hart, a Detroit Lions end. It was Hart who was being considered by the studio, but he flopped while Universal execs flipped over Adams. The studio changed her first name from Betty to Julia (and later to Julie). Her main claim to fame became her role as bathing beauty Kay Lawrence in the black-and-white 3D monster horror film Creature from the Black Lagoon (Jack Arnold, 1954). Creature from the Black Lagoon received positive reviews from critics upon its release and is now considered a classic. 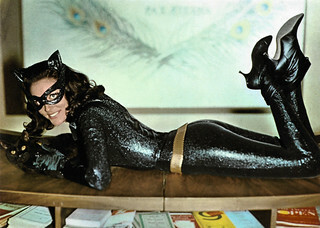 Adams reportedly had to perform most of her own stunts. I.S. Mowis at IMDb: "Shot in 3-D on a shoestring budget, the picture was light on script but strong on atmosphere and proved once again that style can succeed over content. The not inconsiderable physical charms of Miss Adams often dominated the scenery and gave the 'Gill Man' a run for his money. Audiences approved and 'Creature' spawned two further sequels, alas without Julia and with diminishing returns." 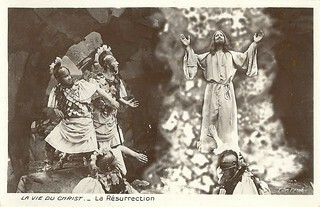 Italian postcard by Bromofoto, Milano, no. 551. Photo: Universal International. Julie Adams co-starred in several 1950s films opposite some of Hollywood's top leading men, including with James Stewart in Bend of the River (Anthony Mann, 1952), with Rock Hudson in The Lawless Breed (Raoul Walsh, 1953) and One Desire (Jerry Hopper, 1955), and with Tyrone Power in The Mississippi Gambler (Rudolph Maté, 1953). She also appeared opposite Glenn Ford in The Man from the Alamo (Budd Boetticher, 1953), and with Joel McCrea in The Gunfight at Dodge City (Joseph M. Newman, 1959). Signed to a seven-year contract (and having her legs insured by Universal to the tune of $125,000 by Lloyds of London), Julia seemed destined to remain perpetually typecast as a western heroine. But Adams also starred with George Nader and Elsa Martinelli in Four Girls in Town (Jack Sher, 1957), a romantic comedy about four young women competing for the leading role in a new film, featuring an international cast. And she appeared with Elvis Presley in the musical-comedy Tickle Me (Norman Taurog, 1965). Adams is also known for her TV roles as Paula Denning on Capitol and as Eve Simpson on Murder, She Wrote. Julie Adams was married twice. Her first husband was writer-producer Leonard Stern (1951-1953; divorced). In 1955, she married actor Ray Danton, and they divorced in 1978. The couple had two sons: Steve Danton and Mitchell Danton. With Mitchell, she authored a book on her life and career, 'The Lucky Southern Star: Reflections From The Black Lagoon', which was published in 2011. After her (voice) role in the film Carnage (Roman Polanski, 2011), she retired from acting at age 84. 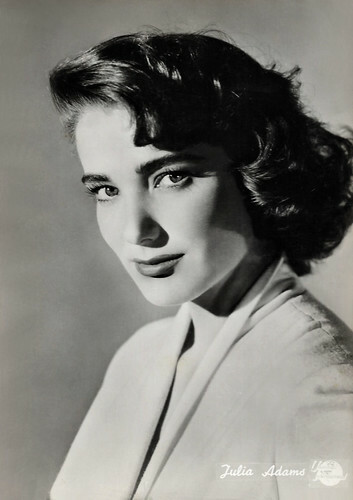 Julie Adams passed away on 3 February 2019 in Los Angeles, USA. She was 92. Trailer Creature from the Black Lagoon (1954). Source: Humanoidity (YouTube). Sources: I.S. Mowis (IMDb), Wikipedia and IMDb.